We specialize in Waterproof Labels, all weatherproof that are suitable for facing wet conditions for commercial and industrial uses. These are high durability, heavy duty labels. If you need labels that will get soaked and wet without peeling off, contact us and we can assist you with the right product for each individual application requirements. Our durable custom waterproof labels are ideal for medical, engineering, and industrial workplaces and they can be customized with the designs that you need for your equipment or workplace. 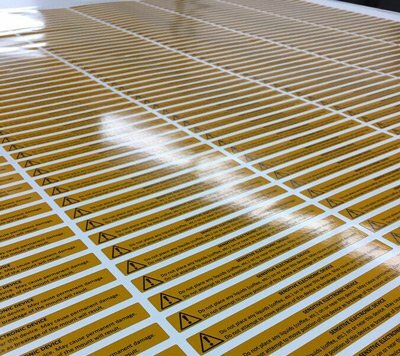 Not only are these Waterproof Labels weatherproof and guaranteed to withstand extreme conditions, but we also offer a wide range of shapes and sizes for your labels, custom or standard. Each custom weatherproof sticker is printed on premium vinyl and can be coated with protective laminate with a permanent or a removable adhesive backing. Our Waterproof Labels are ideal for Vehicle glass or body surface, Boat surfaces, Industrial, medical and farm equipment, Construction and machinery equipment, Sporting equipment goods, Heating and air conditioning and ducting units, Outdoor venues (ski resorts, snow-mobiles, racetracks) and Just about any outdoor application you can imagine! Thanks to an aggressive permanent backing, our waterproof sticker products withstand anything you throw at them. Wet, rainy beaches to cold, misty mountains — our stickers are rugged and ready for the duty. We can provide window stickers, dishwasher safe stickers or a power wash safe labels… We can create the custom labels for vivid applications! At Multicolor Labels, we provide digital printing for several types of removable labels, static clings, clear stickers, and reflective stickers. Our custom printing solutions can help protect your company’s product labelling with high quality, full-color custom Waterproof Labels. Check our our selection of weatherproof labels such as our cold weather labels and high temperature labels. Contact us for more information on our custom quotes and low minimum short runs. We ship our products across North America including Ontario, New York and California.